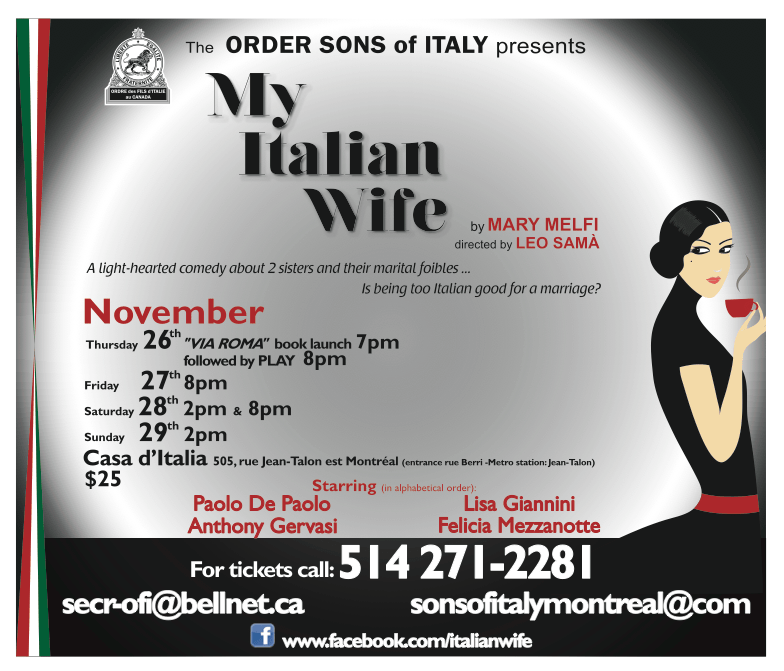 Guernica author Mary Melfi’s play My Italian Wife will be performed by The Order of the Sons of Italy in Montreal from November 26th to November 29th, at the Casa d’Italia 505 Rue Jean-Talon E. The performance will be directed by Leo Samà, and stars Paolo De Paolo, Lisa Giannini, Anthony Gervasi, and Felicia Mezzanotte. The first performance will follow a launch of Melfi’s book Via Roma at 7:00 pm. My Italian Wife is “a light-hearted comedy about two sisters and their marital foibles”.The play focuses on Rita Romano, a teacher of Italian background, who suspects that her younger sister is having an affair with Rita’s surgeon husband. The conflict between Rita, who grew up poor but is now rich, and her sister Paula, who grew up rich but is now poor, exposes disagreements in tradition and values. Although Rita is Italian-born and her sister is born in Canada, the two sisters love each other despite these differences. For more information, visit The Order of the Sons of Italy website at http://www.sonsofitalymontreal.com, or visit their Facebook page https://www.facebook.com/italianwife. Tagged with Mary Melfi, My Italian Wife, Order of the Sons of Italy, Via Roma.